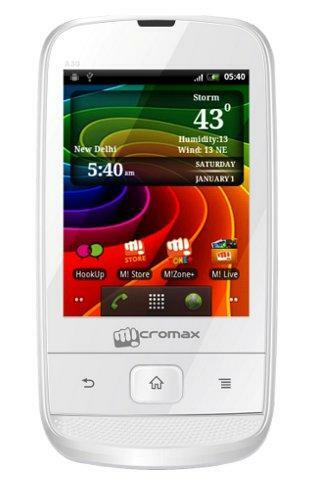 Another low-cost Android phone from the popular Indian brand Micromax. They face tough competition from Karbonn, so they need to introduce much better smartphones at cheaper rates in order to keep their space in the high competitive mobile phone markets in India. Being an entry level Android phone, the Micromax A30 packs good features at a cheaper price of Rs.3,849 in Indian online stores. Now you can buy it online from Saholic online shop, which is the one and only leading online shopping website where this smartphone is currently available. There you will get free shipping and also an option to pay cash on delivery. Now, let us look at the components of this device. Also Read: A review of Yu Yuphoria - How does it fare? The phone comes with relatively low end features that are best under the budget. Sporting the Android 2.3 Gingerbread operating system, this one comes with 832 Mhz Broadcom ARM11 processor that will deliver high speed and performance for the device. 256 MB RAM and 512 MB ROM will help you to reduce the load of processor and to make the phone perform faster. The '3.0' in the name indicates the display size which is 3 inch capacitive touch screen with a resolution of 240 x 320 pixels and 256,000 colours. It is dual SIM supported, coming with Dual Standby option. Having a 2 mega pixel back camera that features LED flash to give your photos decent clarity. Camera will capture JPEG format pictures and it has Night Vision feature, 2x digital zoom etc. Equipped with 512 MB internal memory, this phone has an expansion slot which can be used for expanding up to 32 GB using microSD cards. Being a 3G supported entry level smartphone, the Smarty 3.0 will give you 7.2 Mbps HSDPA 3G, Wi-Fi, Bluetooth and also a USB port for connecting your phone with other devices. Packed with a FM Radio with recording option, this one will play MP3, AAC, AAC+, MIDI and AMR format audio. The Li-Ion 1500 mAh standard battery will give you up to 6 hours of talk time and 7 days of standby time. Along with built-in XHTML browser, you have also got an Android browser for connecting to internet. The Google Play app that comes with this phone will let you download apps, music and games from the online store. Another catchy feature of this device is its Anti-theft mobile tracker app that lets you track your phone if it is lost or stolen. The main competitor of Micromax A30 will be the Karbonn Smart A2 which comes with better features than A30 and at a price tag of Rs.4,990 in Indian stores. When comparing both these phones, we can see that, they are having the same OS (Android Gingerbread), 256 MB RAM and dual SIM facility. But Smart A2 is packed with 1 GHz Processor, 3 MP primary camera and VGA secondary camera, 4 inch TFT touch screen etc which are better when comparing with A30. If you ask me which is worth buying, I will always recommend you to go for Smart A2. Even though the price is little bit higher, you can assure better performance in that one. Now drop your views in the comment box.